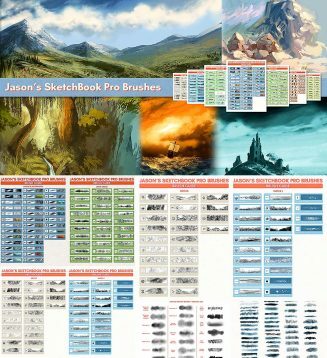 This set consists of over 320 seperate brushes in themed subsets including art brushes, foliage, trees, rock, grasses, ground surfaces, clouds, snow and more. File format: .skbrushes for Photoshop or other software. Tags: art brushes, autodesk, brush, foliage, rock, sketchbook, trees.